Chicken livers are an acquired taste, but to anyone who appreciates the more advanced Southern comfort foods, they are a delight. The problem is that in Macon, the few places that serve them tend to overcook them so much that they end up resembling charcoal briquettes or lava rocks, depending on your preference for outdoor grilling. Chicken livers are an acquired taste, but it is a taste more easily acquired when you try them at a place that cooks them right. Nice golden brown with a soft interior is how they do them at the Grey Goose. Also pictured, mac n cheese, broccoli and cheese and a corn muffin. Photo by Doug Deal. When I get a craving, my one go to place for tender golden brown chicken livers is The Grey Goose Player’s Grill. The little restaurant and bar is in the Forsyth Landing shopping center at 4524 Forsyth Rd in Macon and has quite a loyal following of regulars that the staff seems to greet as friends. The friendliness of their staff and the consistent quality of their food is likely a big reason for the crowd we saw on a Wednesday night. The livers are part of their weekday specials that start at $5.99. The livers are a little more, but the value is still incredible. Besides your main entree, you get a choice of two sides and a bread. 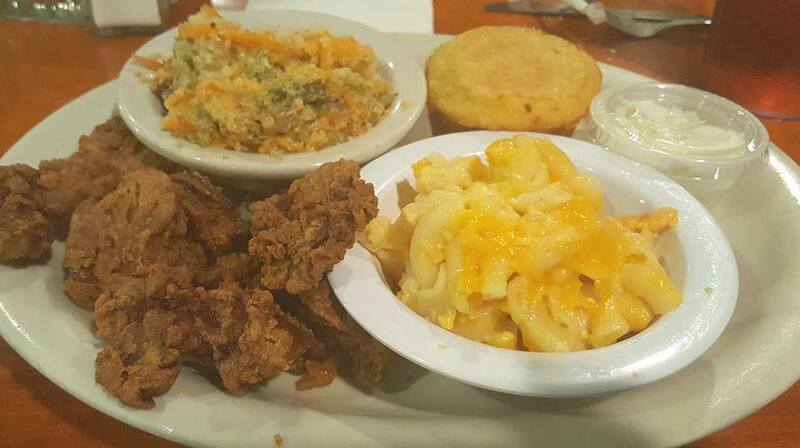 Sides are a choice of home-style vegetables, broccoli and cheese casserole, various beans and peas, corn nuggets, fried okra or steamed vegetables. I chose the broccoli and cheese casserole and mac ‘n cheese. Both were enjoyable, and being staple comfort foods, they accented the plate very well. My preference was to dip the livers into a small cup of Texas Pete hot sauce and every morsel was a absolute delight. I don’t know if others eat them this way, but something about the combination makes my mouth water even while writing this a hours later. Personally, I shy away from deep frying at home because of how hard it is to get the right level of doneness on the inside and a perfect crispy outside. Every time I’ve ordered them at the Grey Goose, they have been spot on. The last part of my meal was a cornbread muffin. I usually take cornbread sweet, but I still liked their more Southern style recipe with a pat of butter. It was moist and held firm and wasn’t crumbly and dry like it is at some other places. One of the joys of having young kids and a wife when I go out is that they don’t always finish their food and I get a chance to sample what they ordered. My wife got the Gooseburger and it was outstanding with the proper amount of cooking with good seasoning to the meat and no dryness. I think you can find a better burger in Macon at one or two spots, but not a half-pounder for $6.99 with a side included. My wife got the sweet potato fries as her side and although I pretty much do not like sweet potatoes in any form known to man, these were better than most, with a crispy and firm and not dried out. I’ve been to the Grey Goose infrequently, mostly because it is off my beaten path, but would definitely like to make room in my schedule to go there a little more often. They also have lunch deals that are also a good deal. It is refreshing to be satisfied for a meal under $10 a person including tip. For more information, see their website or Facebook page. You can also view their menu. I’ve included their lunch menu below. 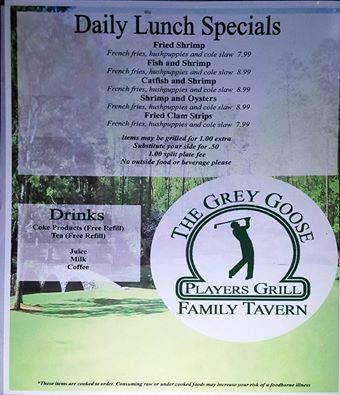 The Grey Goose has a lot of special, including weekly menu items to please just about anyone. Their lunch is a particularly good value. Photo by Doug Deal.